I absolutely love graphic novels for kids! I can’t get enough of them and neither can the kids at my school (especially the girls). There are more and more great graphic novels being written and produced for kids and there really is something for every sort of kid. These are a selection of recent reads that have stood out for me. If you’re looking for some great new reads for your graphic novel collection I highly recommend these ones. This is a hilarious story about two cats who do good deeds dressed in a dog suit. August is a brilliant inventor who is afraid of the outdoors and Charlie is the pilot of the suit and isn’t afraid of anything. Together they are a sort-of robo-Lassie (along with their sentient litter-box), rescuing a baby from a well and saving people from a burning building. In to the story comes a strange family with an evil baby whose aim is to control every animal on earth. It’s up to Sparks to save the day and stop their dastardly plan. I smiled the whole way through this graphic novel because the humour is spot on. I could hand this to any kid from Year 4-Year 8 and I’m sure they would love it too. The Adventures of Jack Scratch: The Quest for the Hiss-paniola by Craig Phillips. Cucumber Quest #1: The Donut Kingdom by Gigi D.G. The seven kingdoms of Dreamside need a legendary hero. Instead, they’ll have to settle for Cucumber, a nerdy magician who just wants to go to school. As destiny would have it, he and his way more heroic sister, Almond, must now seek the Dream Sword, the only weapon powerful enough to defeat Queen Cordelia’s Nightmare Knight. This is the first book in a new series (that started out as a web comic). It’s another hilarious story with fantastic characters. The BLT Trio had me laughing out loud and I hope to see more of them as the series progresses. The world that the story takes place in reminded me of Adventure Time so any kids who love that will love Cucumber Quest. The kids that I’ve passed this on to have loved it just as much as I did and we all can’t wait for #2 to be available in NZ. Perfect for ages 10+. This is a wonderful new graphic novel adaptation by Mariah Marsden and Brenna Thummler. It perfectly captures the essence of the story and will hopefully open up the story to a new generation of readers. The Witch Boy is about 13-year-old Aster who is expected to grow up to be a shapeshifter when he really wants to become a witch. In his family all the females are witches while all the males are shapeshifters, but Aster has always found witchcraft more exciting. When some of the males start disappearing and an evil force threatens his family Aster knows that he can help – as a witch. With the help of his non-magical new friend Charlie, he sets out to help his family using his witchcraft skills. It is a fantastic story about being different and being who you want to be. This is another graphic novel that the girls at my school have been gobbling up. Molly’s illustration style is quite similar to Raina Telgemeier which lots of the kids love. A dangerous rally race + archaeology = a whole lot of fun! Clementine Hetherington and her robot brother, Digory, have run away from the orphanage they’ve been living in since their parents died. Clem and Dig want to follow in their famous archaeologist mother’s footsteps, but no one will take them seriously. Their chance arrives when a man from their past saves Digory’s life, and to repay the debt they enter a multiday rally race… to recover stolen artifacts! Clem and Dig hope to win so they can give them to a museum, but their opponents want to sell them on the black market. The Ironwood Race has no rules, and Clem and Dig might be in over their heads! This is an ingenious mash-up that I couldn’t get enough of. Before I knew it I had finished the book and I’m dying for more! This story is sure to keep even the biggest non-reader engaged. Those kids who love action-packed movies with great baddies and lots of explosions will love this book too. What kid hasn’t pretended there are microscopic people living microscopic lives right under our noses? In Max and the Millions Ross Montgomery takes readers in to the tiny world of Floor that the Blues, Reds and Greens call home. They are at war for the control of Floor but little do they know there is something much bigger that could mean the end of their civilisation. Demon is coming and he is bringing his vacuum cleaner! There is one person who can save them and his name is Max. Although Max needs hearing aids to hear it is his ability to lip read that helps him to communicate with these microscopic people and help them when they need it the most. I absolutely loved Max and the Millions! Ross Montgomery had me captivated from the first page. The story cast a spell on me and I couldn’t stop thinking about what might happen next. There is lots of action, both in Max’s world and in the land of Floor, as the story switches between the points of view. There is also a touch of mystery as you are trying to figure out what happened to the School caretaker, Mr Darrow, and where the people of Floor have come from. I loved the characters, both good and bad. Max is a loveable character who you routing for the whole way. Mr Pitt on the other hand is a character that you love to hate. He is delightfully horrid and is willing to do anything to get what he wants. It is deliciously satisfying what happens to him in the end. I was sad to say goodbye to Max, Sasha, Luke and Ivy but I can’t wait to push this book in to the hands of young readers at my school. It’s perfect for fans of M.G. Leonard’s Beetle Boy. I love reading translated fiction, especially for children. Some of my favourite stories were not originally published in English – Inkheart by Cornelia Funke was originally published in German and The Watcher in the Shadows by Carlos Ruiz Zafon was originally published in Spanish. Thank goodness for publishers like the wonderful Gecko Press who translate the best books in to English for children to enjoy here in New Zealand. Gecko Press’ latest translated gem is The Ice Sea Pirates by Frida Nilsson. This wonderful story brought back memories of the first time I read my favourite book, Inkheart, as it took me on an adventure that swept me away. Siri lives on a small island with her younger sister, Miki, and her old, tired father. An outing on a nearby island to collect berries ends in tragedy as Miki is taken by pirates. These are not just any pirates, but those from the Snow Raven, a ship from the stories that Siri tells her sister. The Snow Raven is captained by the most wicked pirate in all the seas, Captain Whitehead, a pirate with hair white as snow and a heart as empty as an ice cave. Children who are taken by Whitehead are never seen again as they get sent to work in his mines until their bodies and minds are broken. Siri knows that she is the only person who can save her sister and so sets out to get her back by any means. The Ice Sea Pirates is an adventure story full of pirates, wolves, mermaids, frozen landscapes and a whole lot of heart. It is a story about an incredibly brave girl who never gives up on her search for her sister. Frida Nilsson, and her skilled translator, Robert Graves, transport the reader to the unforgiving Ice Sea and make you feel that you are right there beside Siri the whole way. You feel the biting, icy wind, feel Siri’s gnawing hunger and her heartache for the friends she makes along the way, and hear the creaking and groaning of the frozen sea. The writing is beautiful. Some of the descriptions of the characters and places were so perfect that I had to reread them several times. Siri is one of those characters that becomes your best friend. You are right there beside her and get inside her head. She goes through so much on her journey to find her sister – she leaves home by herself to rescue her sister, faces down white wolves, stows away on boats with angry men, and stands up to vicious pirates – but she never gives up. She is determined to find her sister, rescue her friend and protect those who cannot protect themselves. I loved The Ice Sea Pirates and I know that Siri and her story will stay with me for a long time. It is the perfect read aloud for ages 9 and up and I highly recommend it for anyone who loves adventure stories with a touch of magic and wonder. From the moment I started reading M.G. Leonard’s debut, Beetle Boy, I fell in love with her storytelling, her characters and her wonderful beetles. I gobbled up Beetle Boy and even a year after reading it I find myself thinking about Darkus and his friends. I have been eagerly anticipating the sequel, Beetle Queen, for ages because I need to return to that story and find out what is happening. I couldn’t wait until it is released in New Zealand (and neither could several of my favourite readers at my school) so I bought a copy from the UK. Beetle Queen is even better than I was hoping it was going to be. Cruel beetle fashionista, Lucretia Cutter, is at large with her yellow ladybird spies. Beetle Queen is a superb sequel and I would say it’s the best second book in a trilogy that I have ever read. M.G. Leonard transports you straight back in to the story, almost exactly where the previous book ended. All the things that I loved about Beetle Boy are in Beetle Queen – the wonderful characters that you either love or love to hate, the brilliant storytelling which feels quite magical, the sense of adventure, and all the beetles. The sense of joy that Darkus experienced after rescuing his dad and bringing him home doesn’t last long before he loses him again. We saw the determination of Darkus, Bertolt and Virginia in the first book so we know that they will do anything to stop Lucretia Cutter’s plans and bring Darkus’ dad home again. The thing I love the most about Beetle Queen is M.G. Leonard’s characters. Darkus, Bertolt and Virginia are clever, determined and caring. They would do anything to protect their beetle friends and they certainly have plenty of challenges that they have to face in Beetle Queen. Humphrey and Pickering, the bumbling (and quite peculiar) cousins are back again and trying to get what is owed to them by Lucretia Cutter. They make me laugh every time they appear in the story because they are just so hopeless and you know things aren’t ever going to go well for them. Lucretia Cutter is delightfully sinister and we learn more about her wicked plans. I love Baxter, Newton, Marvin and Hepburn, the beetle side-kicks who all play important roles in Darkus’ plans to stop Lucretia Cutter. They manage to express so much with just a flutter of elytra or twitch of antennae. The stand-out character in Beetle Queen though, for me, has to be Darkus’ Uncle Max. He kept on surprising me in this book, because he often reacted quite differently to what I was expecting. He is very supportive of Darkus and always backs him up. I am so excited to read the finale, Battle of the Beetles, but I’ll have to wait until next year to find out how it all ends. In the mean time I urge everyone to read Beetle Boy and Beetle Queen because you will fall in love with Darkus and his Coleopteran friends. They are the perfect books to read aloud to a Year 5 or 6 class or snuggled up in bed with your children at night. 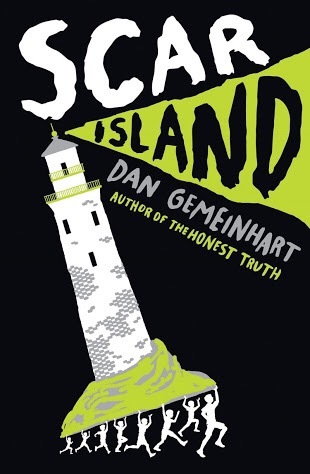 I loved Dan Gemeinhart’s first book, The Honest Truth. It was heartbreaking but such a great story. I was curious to read his new book, Scar Island (which came in the Scholastic Standing Orders). Wow, this book is amazing! I’ve just finished it (thankfully my toddler had a long nap today!) and it kept me on the edge of my seat the whole time. The story focuses on Jonathan who has committed a terrible crime that he doesn’t speak about. He has been sent to Slabhenge Reformatory School for Troubled Boys, a crumbling island fortress that was once an insane asylum. Jonathan is here with 15 other boys who have created various crimes and we meet them through the course of the story. The place is cold and wet and the boys get treated horribly, until something happens to the adults, leaving them to fend for themselves. There are no rules – they can eat what they like, sleep where they like and do whatever they want. However one of them decides that he is in charge and things start to get out of control. When a huge storm heads for the island their world starts to crumble and the only way they can survive is if they work together. Scar Island is like Holes and Lord of the Flies rolled in to one. It is one of those books you just don’t want to put down. When you’re not reading it you’re wondering what will happen next. It’s an adventure story and a survival story with a dash of darkness. It’s an immersive story too because you can feel and smell the damp, cold fortress, hear the click of the rats scurrying paws and feel the fear and dread of these boys who are trapped. Dan keeps you guessing the whole way through. Although most of the boys explain why they are at Slabhenge Jonathan keeps dodging the question. Dan drip feeds you details but doesn’t reveal everything until near the end. You have to keep reading to find out if everyone survives until the end of the story. Scar Island is sure to be the perfect book to hook reluctant readers and it would make a great read aloud for Years 7 and 8. Philip Reeve and Sarah McIntyre are a dream team. They creative truly wonderful books together that grab readers’ attention. I have loved both of their previous books together, Oliver and the Seawigs and Cakes in Space. I get really excited every time I see they have a new book coming out and I can always tell by the title and the fantastic cover that it is going to be another great book. They even have their own ‘A Reeve and McIntyre Production’ logo that Sarah has created. Philip and Sarah’s latest collaboration is called Pugs of the Frozen North and it’s their best book yet! The race to the top of the world! It comes around once in a lifetime – and the prize? Your heart’s desire. Shen and Sika can’t resist the chance to win, but competition is fierce. The path to victory is littered with snow trolls, sea monsters and a gang of particularly hungry yetis. But Sika and Shen have something the other contestants don’t have. Actually, they have 66 other things – PUGS, to be exact. That’s a 264-paw-powered sled. Let the race begin! Pugs of the Frozen North is an action-packed, fun-filled spectacular of a book. One moment you’ll be holding your breath in anticipation and the next you’ll be laughing out loud. You meet Snow Trolls, sea monsters, hungry Yetis and all sorts of wonderful characters in Pugs of the Frozen North. I don’t think there is another author and illustrator team that are so perfectly matched as Philip and Sarah. They come up with the ideas for their books together, then Philip writes the words and Sarah draws the pictures. You can tell they have a lot of fun coming up with their stories as they are just brimming with imagination. In Pugs of the Frozen North, True Winter arrives, freezing the seas and bringing adventurers from miles around to join the race to the top of the world. Everyone wants to be the first to reach the Snowfather at the top of the world and have their wish granted. Shen has been abandoned by his captain after their ship is frozen in the ice and he is left stranded with only sixty-six pug dogs to keep him company. Luckily Shen finds Sika, a girl who lives in the village of Snowdovia with her mother and grandfather. Sika really wants to enter the race to the Snowfather and thanks to Shen she now has sixty-six pug dogs to pull her sled. Shen and Sika are racing against other more experienced adventurers, including Professor Shackleton Jones with his high-tech sled and SNOBOT companion, Helga Hammerfest and her team of polar bears, Sir Basil Sprout-Dumpling and his butler Sidebar, and the glamorous Mitzi Von Primm. Someone is determined to take their fellow contestants out of the race and win the prize for themselves. There are also Snow Trolls, sea monsters, hungry Yetis and fifty different kinds of snow to deal with. The main appeal of Philip and Sarah’s books for me is that they are chock-full of Sarah’s cute and comical illustrations. I’ve never seen a pug dog look as cute as the ones that Sarah has drawn in this book! Sarah truly brings the characters to life, from the pompous Sir Basil Sprout-Dumpling to the cuddly-looking Yetis. The limited tone of the illustrations (green, white, black and grey) gives the illustrations an icy feel. I also really love the cover, which I think looks incredibly appealing to kids. Pugs of the Frozen North is one of my favourite books of the year. This wonderful book has all the elements that I love in a story and I can’t recommend it highly enough. 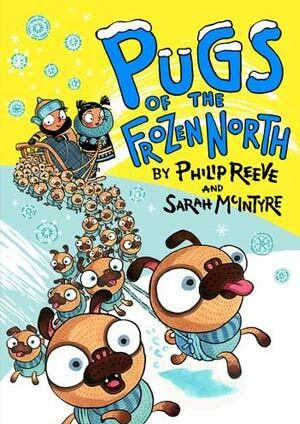 Curl up with Pugs of the Frozen North and you’ll be sure to fall in love with Philip Reeve and Sarah McInytre’s books. I love ghost stories, adventure stories, and stories set in New Zealand. Sue Copsey has combined all of my favourite types of stories in to her explosive new book, The Ghosts of Tarawera. The Ghosts of Tarawera is an action-packed adventure with a good dose of spookiness. Much like the pressure building inside a volcano, the suspense builds until it reaches its explosive conclusion. There is a sense of impending doom right from the start which made me want to keep reading to find out how it all ended. The front cover (which I love) suggests that an eruption will occur, but when, where and how you just don’t know. The story is set around Rotorua in the modern day and follows Jo and Eddie who are on holiday with Jo’s family. It reminded me of Elsie Locke’s Canoe in the Mist (which was set in 1886 at the time of the huge eruption of Mount Tarawera). The ghostly waka that warned of the 1886 eruption appears in The Ghosts of Tarawera to warn Joe of the trouble that is brewing below them. Sue also looks at how ghosts might use other ways to communicate in the age of smart phones. Not only does Jo see the ghostly waka, he is also sent strange text messages and Facebook messages that are trying to tell him something. I loved this idea! Sue really emerses you in the setting. There is a real sense of place in this book – you feel like you are there at Lake Rotomahana and you can almost smell the sulphur, hear the mud bubbling, hear the birds singing in the bush, and feel heat of the hot pool. Sue made me want to visit Lake Rotomahana and see everything for myself, even with the fictional eruptions of the story. I really like Sue’s characters. The kids are very relatable and the adults are role models that the kids look up to. I especially like Rocky and Buzz, the two cool GNS geologists who are camped beside the lake investigating the Pink and White Terraces. They take Jo and Eddie under their wings and get their help with taking readings around the lake. Thanks Sue for giving boys some great positive male role models in Rocky and Buzz! This is something for everyone in Sue Copsey’s books. They are perfect for fans of Des Hunt or anyone who just loves a good adventure story. Make sure you check out Sue Copsey’s Seriously Spooky Guest Post about why she likes scary stories. I’ve been a huge fan of Barry Hutchison for ages. He is one of those incredibly talented authors who can write for all ages and in a range of different genres. His Invisible Fiends series is one of my favourite series and is delightfully creepy. I was sucked in to the series with Mr Mumbles and eagerly awaited the next books in the series. Barry’s next few books, The 13th Horseman and The Book of Doom were hilariously funny books for older readers and I loved these just as much. Earlier this year Barry released the first book in his brilliant new series for younger readers all about Benjamin Blank, The Shark-Headed Bear-Thing. In an alternate 15th century, where dragons roam, sailing ships transform into submarines, and blacksmiths build steampunk robots, ten-year-old orphan Benjamin Blank battles monsters, rescues maidens and discovers fantastic new lands, but never quite manages to get his homework handed in on time. Each adventure sees Ben and his friends, Paradise Little and Wesley Chant, face a new monstrous menace. The Shark-Headed Bear-Thing is a hilarious, rollicking adventure that will have you laughing out loud as you follow Ben and his friends on their quest. Ben desperately wants to be a hero and when a girl called Paradise turns up in his village looking for a warrior, Ben sees his chance. A monster is terrorising Paradise’s village and she needs a warrior to save them and vanquish the monster. Ben hasn’t had much practice but he’s the only warrior around that can help. Armed with a magic gauntlet, Ben sets off with Paradise to save her village from the Shark-Headed Bear-Thing. The thing I love the most about Barry’s books is the dialogue. The conversations and interactions between his characters always makes me laugh and I certainly laughed my way through The Shark-Headed Bear-Thing. This is a perfect book to read aloud as it really keeps kids’ attention. There is one particular part of the book, involving a troll and his game of ‘Burp-or-Death’ that I love reading out to kids. I can hardly get through this part with out cracking up laughing and kids absolutely love it, especially boys. If you’re looking for the perfect read aloud for ages 8 and up you really can’t go past The Shark-Headed Bear-Thing. I guarantee it will be a winner! I love Chris Mould’s illustrations and they perfectly match Barry’s story! They are quirky and add an extra layer of humour to the story. I especially love Chris’ cover illustration, with the Shark-Headed Bear-Thing creeping up on Ben, and his illustrations of my favourite troll in his y-front undies. There are more books coming in the series, including The Swivel-Eyed Ogre-Thing (which has just been released) and The Moon-Faced Ghoul-Thing (coming in October). I can’t wait to read more adventures of Benjamin Blank and see how he defeats new monsters. Grab a copy of The Shark-Headed Bear-Thing from your library or bookshop now. Yo-ho-ho! Here come the Steampunk Pirates! Avast me hearties! Are you a land lubber lookin’ for a book chock full of adventure on the seven seas, robot pirates, laughs aplenty, and gold? Well the Adventures of the Steampunk Pirates is the series for you. Hop on board The Leaky Battery and set sail with this rag-tag crew. Wanted: Dead or Alive! (Or smashed into little bits and delivered in boxes.) Causing chaos wherever they sail, the robotic Steampunk Pirates are roaming the high seas, hunting for gold! But the evil Iron Duke has other ideas…He’s determined to capture the pirates in return for a handsome reward from the King. Can these mechanical marauders stay one wave ahead of their enemy? The Leaky Battery Sets Sail is the brilliant first book in Gareth P. Jones’ swashbuckling new series, Adventures of the Steampunk Pirates. The Steampunk Pirates are a crew of robots who were once servants. They decided they didn’t want to be bossed around so acquired a ship and set out to find adventure. Their crew is made up of their hot-headed leader Captain Clockheart, First Mate Mainspring (who gets dangerous when he gets overwound), Quartermaster Lexi (the brains of the crew who is fitted with an information file), Mr Gadge (so named because of all the gadgets he can attach to himself) and twelve other robotic low-lifes. Their first adventure sees the Steampunk Pirates on the hunt for all the loot they can find. They’ve discovered that life at sea isn’t so great when you’re made of metal because it rusts in the salty sea air. They hear of an alchemist who can turn metal in to gold and Captain Clockheart believes this is the answer to their problems. Along the way they meet the Iron Duke and other nasty humans who try to foil their plans. Adventures of the Steampunk Pirates is perfect for readers aged 7+ who love adventure and love to laugh. They’re quick, fun reads with quirky illustrations that will appeal to young readers. I look forward to seeing what happens in the next adventures of the Steampunk Pirates in Attack of the Giant Sea Spiders. I highly recommend this series and you should definitely search out Gareth’s other books, including the Ninja Meerkats series, The Thornthwaite Inheritance, and one of my favourite books Constable and Toop.